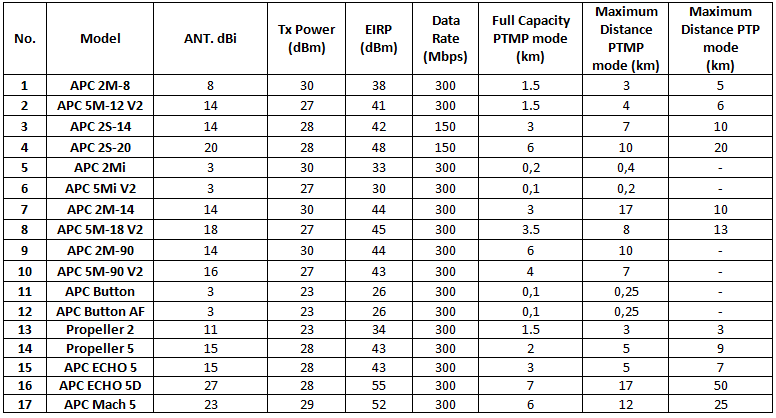 The table of APC products with integrated antennas shows the working distances at full PTMP mode capacity, Maximum PTMP mode distance, and Maximum PTP mode distance. Distances may vary depending on the environmental impact. The table for antenna selection based on distance shows the reference values for the different antennas and distances. We recommend using the Link Calculator to calculate the distance between the devices with custom-selected antenna gain and transmit power.